The automation of many of our jobs – even those that have long seemed safe – is fully inevitable at this point. One study predicts that about 38 percent of American jobs will be at high risk of automation by the early 2030s, which is not that far away. We’re asked to trust that future work could be ‘liberating,’ but considering the way corporations tend to operate, it’s not hard to see why the masses are terrified that robots will soon leave us unemployed and unable to provide for ourselves and our families. 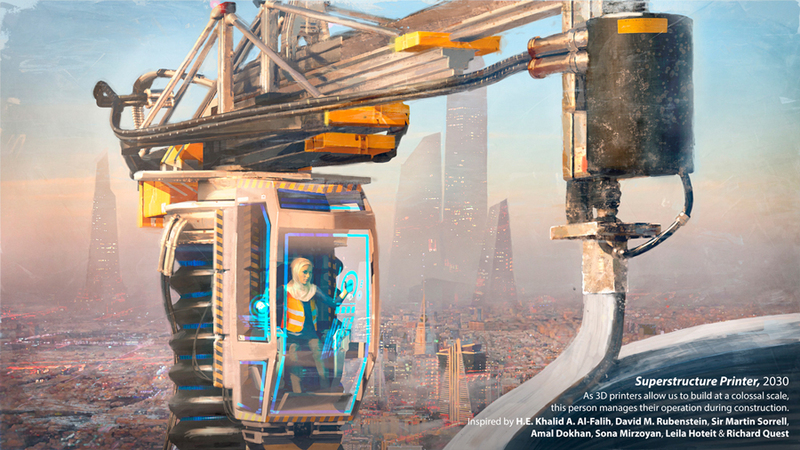 In a scene that definitely looks straight out of a sci-fi movie, a worker sits in a glass pod high over a city, overseeing a 3D printer in the midst of building a superstructure. 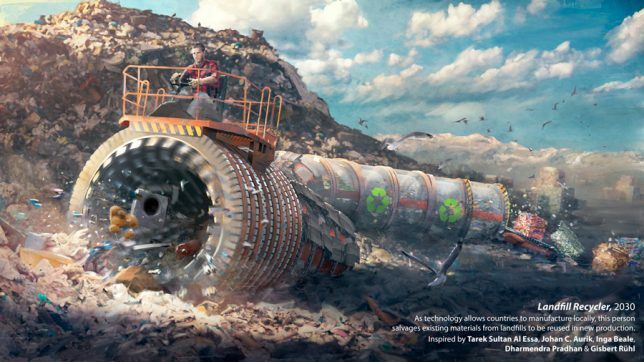 A ‘landfill recycler’ salvages existing materials from landfills to be integrated into new products while sitting atop something that looks like a gigantic vacuum hose. 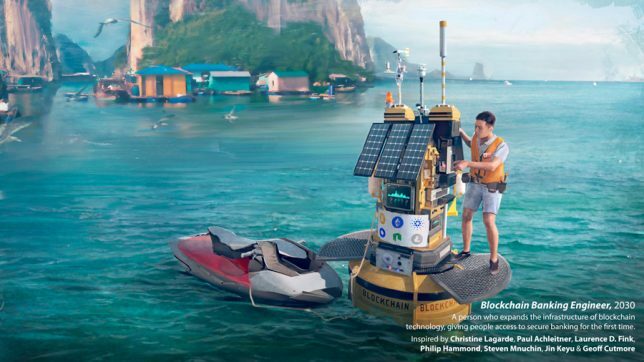 On serene turquoise waters, a ‘blockchain banking engineer’ fine-tunes a floating machine that will give people in remote locations access to secure banking. 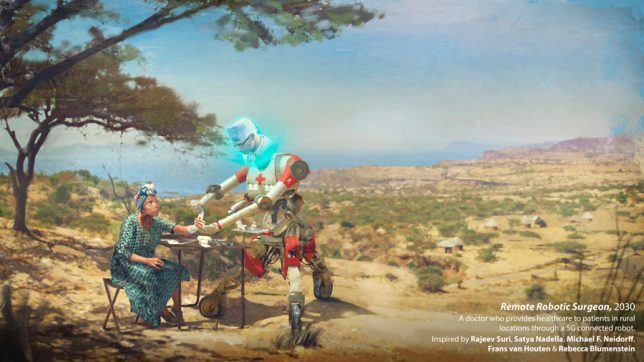 It might be a robot operating on this woman in a rural setting, but he’s got the holographic head of the real surgeon who’s carrying out the procedure from thousands of miles away. A ‘public technology ethicist’ evaluates new technology before it goes live to determine its benefits to the public. 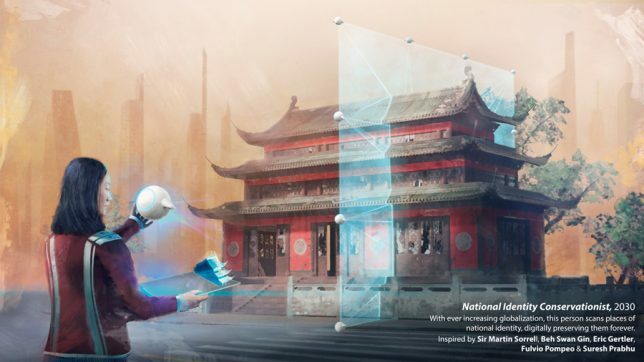 And finally, the operator of a 3D scanning machine captures entire historically significant buildings to ensure that even if they’re demolished, they’re preserved in perpetuity. These illustrations were produced by AKQA London together with Salt and Pepper Creative Studio based on the World Economic Forum panelists’ predictions. Concept artist Florian de Gesincourt created the first sketches, and London retouching studio Happy Finish colored and perfected them. The series was produced in a mere 120 hours in the midst of the forum so attendees could see them. 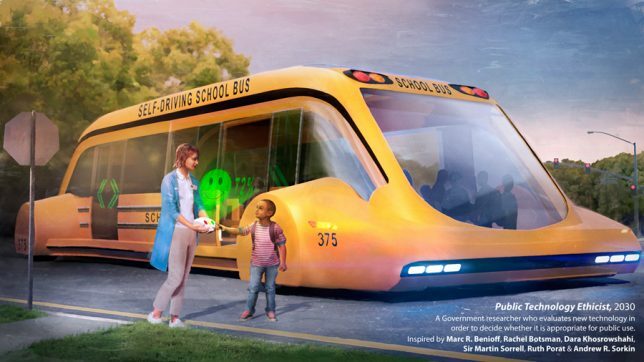 They’re a pretty good reminder that the future is closer than we think.